Honda has brought the VFR1200X to the North American market for 2016. While this motorcycle is new to the North American market, it has been available in Europe since 2012 under the name CrossTourer. Many brands have been trying to play "catch up" to BMW, who have been very successful with their GS / GS Adventure line of motorcycles and Honda is the latest to the jump into to the growing Adventure motorcycle market all be it with a different approach. Instead of building a "do it all" motorcycle, Honda appears to be trying to split the Adventure market into two groups. Those who want a powerful, Adventure style motorcycle that is great on the pavement and may occasionally go off road in the form of the VFR1200X, and those who will be looking for every opportunity to head off road but want the option to travel comfortably on pavement for those long adventures with the "reintroduction" of the Africa Twin. Let's be clear, the VFR1200X is a street bike that will easily handle gravel and packed dirt roads if it's asked. Two transmission options. The standard 6 speed and the upgraded "automatic" DCT. Wet weight of 611 lbs for the standard model and 633 for the DCT model. Honda Traction Control System that can be easily turned off. At 611 lbs, this is a heavy motorcycle and yet it comes off the stand easily and feels much lighter then it is once it's moving. I chose to ride the standard transmission version, mainly because I wanted to ride the motorcycle instead of spending time playing with the DCT. I've heard many good things about the Honda automatic system, however I'm unconvinced that adding an extra 22 lbs is worth the convenience. 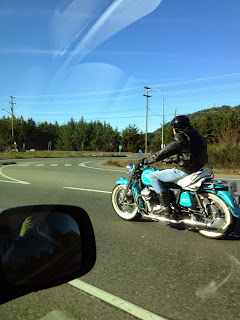 I loved the sound coming from this motorcycle from startup and all through the ride. It reminded me of a well tuned V8 car engine, especially when you open the throttle. The engine is smooth and powerful, moving the big motorcycle down the highway at legal speeds in 4th gear. The torque is impressive and comes into play early. The VFR1200X suspension absorbs the bumps in the road well and makes easy work of tight corners. I found the seat uncomfortable and it pushed me uncomfortably close to the tank. The foot pegs were small, narrow and slick and would be the first item I'd change if owned the motorcycle. Narrow and slick foot pegs - the first item I'd change out. The seat. It's thin and slopes toward the tank - the second item I'd change. The 1,237 cc Engine. It has power and character. The overall style of the motorcycle. It feels lighter then it really is. The Honda VFR1200X is a good motorcycle for the money and is in the same price range as the basic Triumph Tiger Explorer 1200 XR. The Triumph is lighter on paper, however the Honda feels lighter and carries it's weight low where the Triumph is top heavy. Would I spend my own money on this motorcycle? Not really. I'd rather find a low mileage Ducati Multistrada or BMW GS which can had for the same price and have more to offer.